This post covers 5 free websites to convert image to URL. Here I have listed some websites which allow you to upload images and save them for a short time. While uploading an image, you can specify after how much time you want to automatically delete those images. In some of these websites, you can even opt to delete the images after a specific number of downloads. Apart from specifying expiration time, you can opt to crop the image or you can even resize it. After uploading the image, they will give you the image URL and you can use that anywhere you want. Sometimes, while chatting with the tech support team on a live website chat or on forums, you have to give the screenshot from your device to demonstrate the situation. However, most of such services don’t support uploading images directly. In that case, you can use any of the websites that I have listed below. You can upload a screenshot image or any other image from your PC and then you can set an expiration time. And the best part is that for this, you don’t even have to create an account or sign up for any of them. 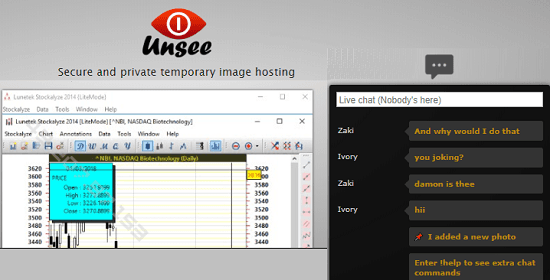 Unsee is a simple and handy websites to temporary store images on its server. The maximum time that it can store your image is one day. And if you want to store your image for shorter time, then you can do that. You can opt to store your image for 10 minutes, 30 minutes, 1 hour, etc., easily. It doesn’t ask you to create an account first in order to get started. And the best part about this online service is that it offers a live chat feature. The URL that it gives you after uploading an image, you can share that with anyone. And on the same web page, there is chatting box that you can use to chat with the other person. You can use the above link to reach its homepage and upload an image. But before uploading an image from your PC, you have to specify the time after which it will delete the image automatically. As your image uploads to the server, it will immediately give you a URL which you can share with anyone you want. And when the other person will open that URL, there is a chatting box as well on the bottom right side of the page. You both can start the chat and talk about the image or do whatever you want. ExpireBox is another simple website that you can try to convert an image to URL easily. Here you can upload a image file having 200 MB size and it can save the image for 2 days. After that, it will automatically delete that. And if you want to store the image for a very short time, then you can do that. However, you cannot specify time here to delete the images automatically. Here it even lets you opt to delete the image after specific number of downloads. The process of using this website to host a temporary image is very simple. Just open it and then upload your image there. After uploading the image, it will give you a URL that you can share with anyone easily. You can use the above link to reach the homepage of this websites and then you can upload your image there. After that, it will redirect you to another page and you can specify other options there. 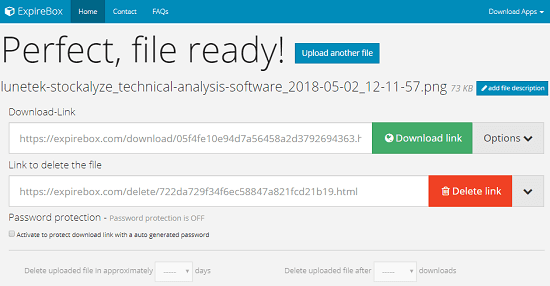 You can specify when to delete this file automatically from the server. After specifying all these parameters, it will give you a download link and then you can do whatever you want. 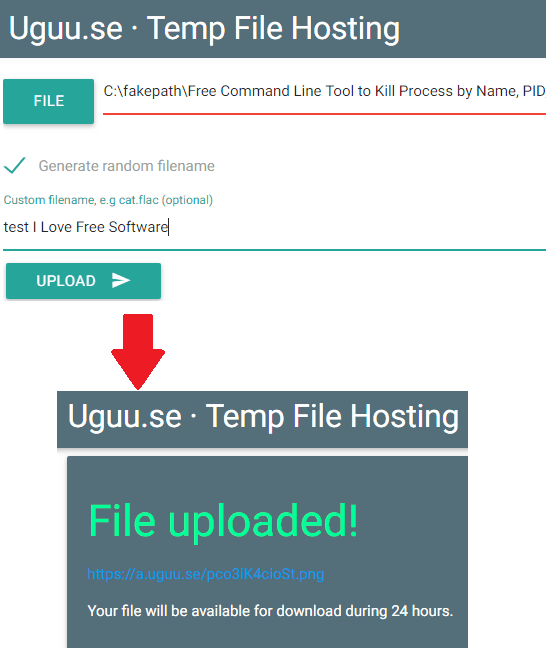 Uguu is an open source online service that you can use to convert an image to URL easily. It keeps the uploaded image on the server for 24 hours. It will give you the URL of the image that you can share with anyone you want. This is a extremely simple website to temporarily host images online for free. And not just images, but you can upload almost any kind of file here having file size less than 100MB. Also, here you cannot specify custom time to delete image automatically. Once you have uploaded an image on this website, it will remain there for the next 24 hours. Uguu being open source, has an advantage that you can run its instance at your side if the main website goes down. You can find its source code on GitHub. To upload an image, just head to its main page and then you can upload your image from the PC. After that, you can specify a name for the image or let it give a random name to your image. Finally, in the end, it will show you the URL of the uploaded image and then you can use that anywhere. 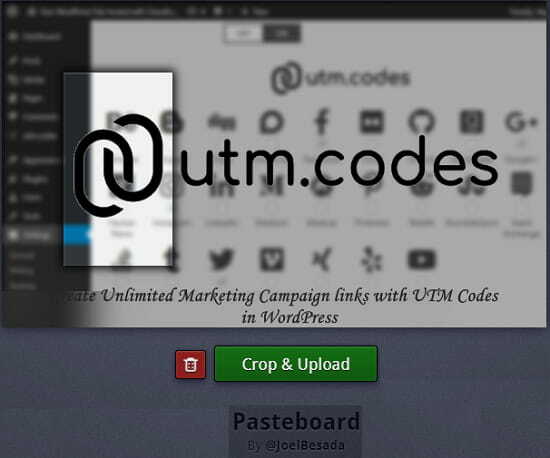 Pasteboard is yet another free websites that you can use to convert image to URL without creating any account. This service is slightly different than what I have already listed in this post. Here it doesn’t give you option to specify time to delete the image. Here you will have to delete the image automatically. The image you upload stays in the server as long as you want it to be there. And you can upload multiple images on this site and get their URLs (not in batch). It uses some cookies to store the information about the images that you have uploaded. Whenever you visit its homepage, you’ll see the images that you have uploaded on it at the bottom left side. It is so simple to use this website to convert an image to URL easily. Just access its homepage using the above link and then upload your image there. And before uploading an image to the server, you can opt to crop it. However, no other options are there that you can specify. After you hit the upload button, it will show you the URL of the image and then you can share that with anyone. If you want to select the image that you have uploaded, simply, open the URL in the same browser that you used to upload that image. You will see Delete button on the web page and you can use that to delete the file immediately from the server. 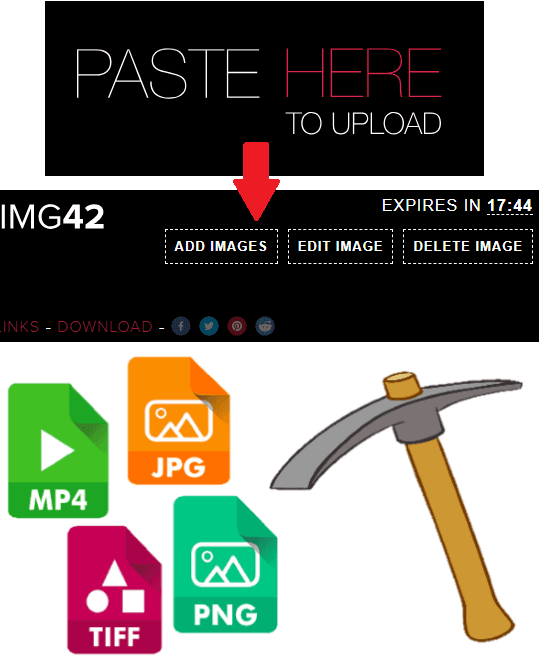 IMG42 is the last free website in my list that you can use to convert an image to URL. Just like the website above, you can use it to store an image on its server forever. But if you want your image to self-destruct, then you can do that. It allows you to specify 10 minute and 30 minutes time and it will delete those images accordingly. Or, if you want to delete the image manually, you can do that. It offers a simple interface and you just have to drag and drop your image over it to start uploading. Access its homepage directly and then you can upload your image. You can simply drag and drop any image on its interface and it will be uploaded. It uploads the image from your PC in a very beautiful manner (pixel by pixel animation) and you will like the animation effect. When it has uploaded the image, you can copy its URL and then share it with anyone. Also, from the top right corner, you can specify when you want to delete this image automatically. These are the best free websites that I have found to easily convert an image to URL. You can use all of these websites without creating an account. And the best part is that you can even opt to delete the images you have uploaded there automatically. 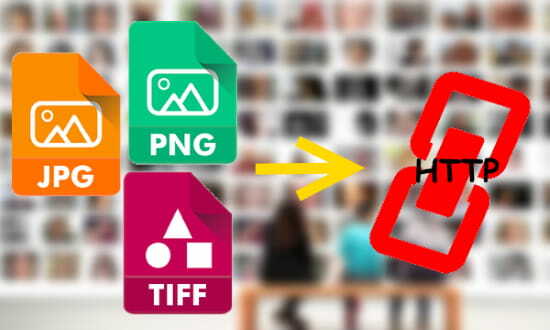 So, if you are looking for some decent image to URL converter services, you can try these website that I have listed here. Personally, I feel that Unsee, IMG42, and ExpireBox are very good options to do that. And if you want some open source services to do the same, then you can try Pasteboard and Uguu.